Near the end of each spring, we eagerly follow the weather forecast to see when it would be sunny and warm enough for us to bring our beloved paddle boards out onto the water. That day for us came in mid-May this year with temperatures in the mid 20s (C). And it kept climbing throughout the rest of the season resulting in an early June heatwave with temperatures reaching 30C. 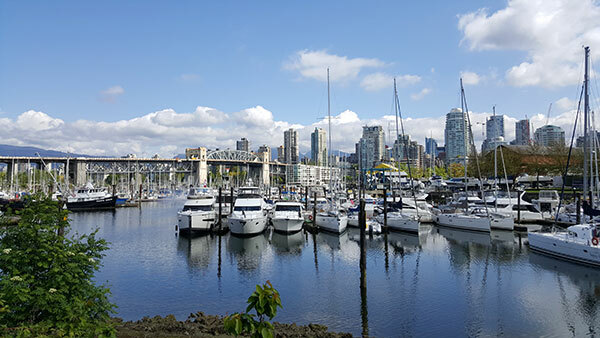 Okay, so you may probably chuckle at these numbers if you’re from a hot climate but these are definitely the numbers that make all of us Vancouverites rejoicing the start of our comparatively short summer season. It rains here almost 7-8 months of the year and even in the summer there are sporadic stretches of rain here and there too. So you can imagine my excitement to dust off our paddleboards – unused since last summer – for the summer season ahead. What is Stand Up Paddle Boarding (aka SUP)? If you’ve been near waterways where people do water sports in the last few years, I’m sure you’ve most likely seen people paddleboarding. You’ll see people standing upright on what resembles a surfboard navigated by the movements of just one paddle. It’s kind of like a cross between surfing and canoeing while standing upright. 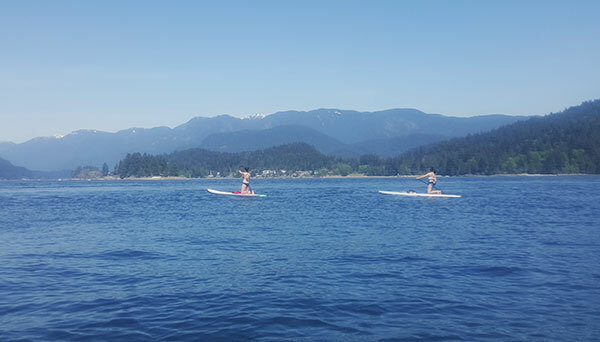 It’s so much fun to be out of the water enjoying the view while doing something physical but without having to get your hair wet 🙂 Unlike a canoe or kayak, you have the flexibility to stand up, sit down or even lay down on your board to suntan. And should you fall off, it’s relatively easy to climb back onto your board as opposed to recovering a capsized kayak alone. What to Bring for Paddleboarding? swimsuit – You can wear it underneath a T-shirt and shorts if desired. Your bottom will get a bit wet if you decide to sit on the board and from launching the board on the shore. a water-resistant bag which you can wear on your back or secure it onto the board. Aquapac – It’s a waterproof case to hold your phone so you can take awesome pics of yourself on the water. In Vancouver, we like to bring our boards to our favorite spot which is Deep Cove in North Vancouver. The waters at the cove are generally calm during times when there aren’t a lot of speedboats on the water as well so it makes for an amazing experience as you trek along the coastline of the cove giving you a nice view of the beautiful waterfront homes on the shore and eventually reaching small islands like Grey Rocks. 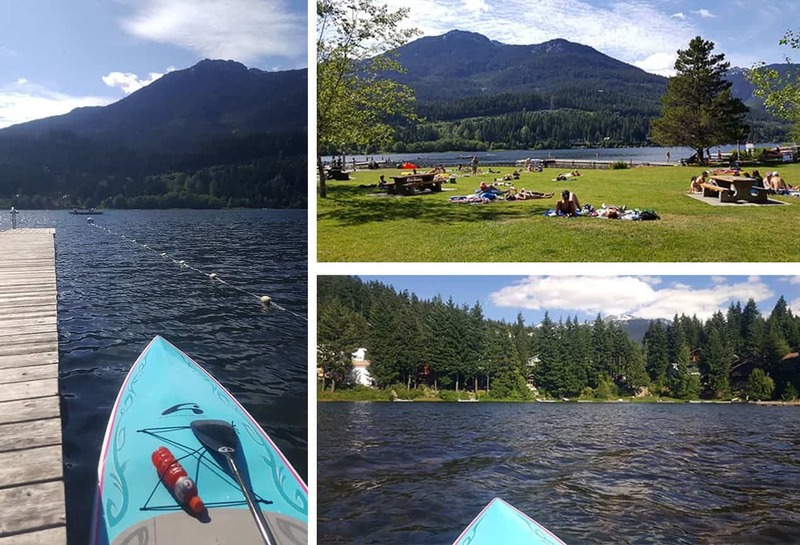 Because of it’s natural beauty and ideal water conditions, Deep Cove is one of the busiest places to rent kayaks, surf skis and paddleboards (or SUPs) so you must do it early. In the summer season, there is no such thing as walk-in rentals. 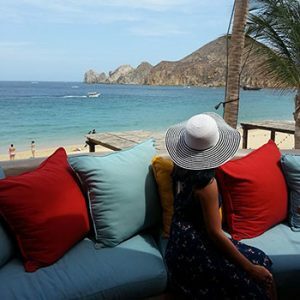 The best time to book would be at least 1 or 2 days in advance, especially if you want to be out there on the weekends. 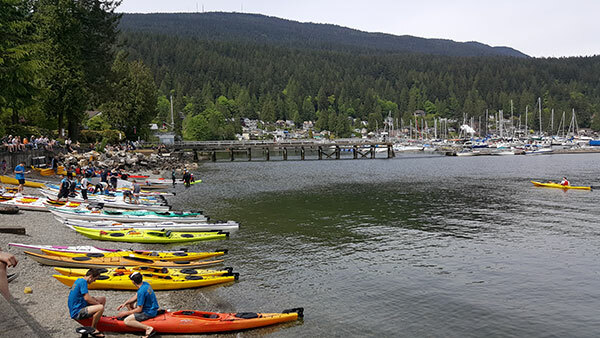 Here is the Deep Cove Kayak website link. Reaching the beautiful Grey Rocks Island with our paddleboards. 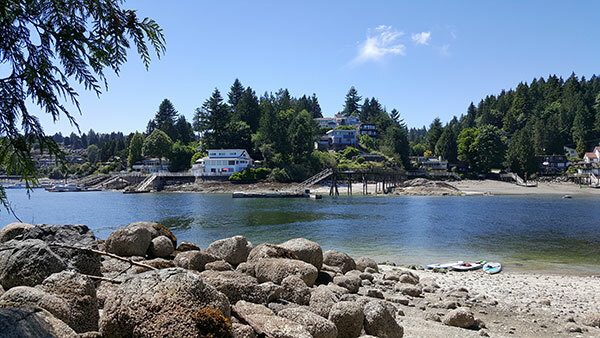 Beautiful little enclave on your approach to Grey Rocks Island and the view of waterfront homes while paddleboarding at Deep Cove. For those in the Tri-cities area, Rocky Point in Mundy Park is another great place where you can rent. 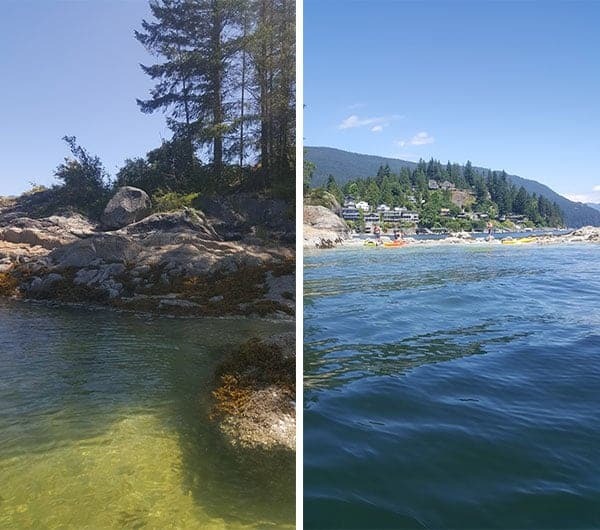 The view isn’t as nice as the one you get at Deep Cove since the shorelines are lined with industrial plants but the wonderful thing that sets this place apart is the opportunity to see sea lions, lots of them, resting on the floating log piles. It’s a wonderful sight. Jericho Beach is known as a great launching area for surfers so you guessed it – the water will be choppy! 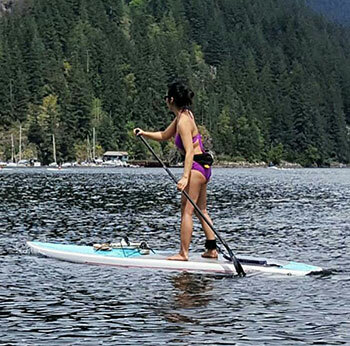 Unlike the relatively calmer warmers of Deep Cove, expect to ride a few waves when you’re out there. Here’s the link to the Windsure where you can rent SUPs, skimboards or windsurfing boards. Alta Lake in Whistler is another favorite of ours. It’s a 5 minute drive from Whistler Village so it makes a perfect daytime activity while you’re up there in the summer season. There is a convenient dock for you to launch your board and the water by the beach is shallow and calm for swimming. Rentals can be made here. I hope you get a chance to try out paddle boarding this summer. One of my girlfriends always noted her desire to go out on the water with me one day. We finally made it happen this year and she’s been hooked ever since. I think she’s well on her way to getting her own board soon because she has quickly fallen in love with it, and I think you will too! Click here to read the PART 2 of the summer activities I shared with Deborah Moore this morning.